I am sure everyone has heard about the 11 year old girl from Forney, TX who won a contest to be Mayor for a day. 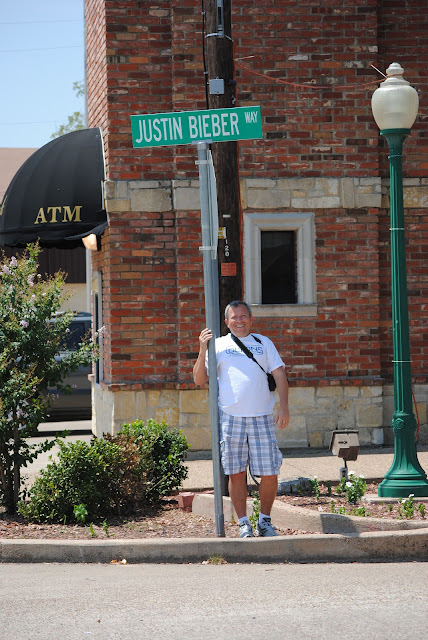 Her first order of business was to rename Main St. to Justin Bieber Way. SO, since Forney is just next door, we had to drive over and get a picture. If you haven't heard the story, just Google, Justin Bieber Forney. Getting the picture wasn't easy, I had to shoo away Grandmas and little girls with bows in their hair. As cars passed by, the drivers would shake their head in disgust. But, I got my picture. You can throw up now.